Welcome to our new weekly series On the Grill, where our Sunday Dinners columnist Tom Hirschfeld will be showing us how to grill everything from steaks to salads with confidence (and style). 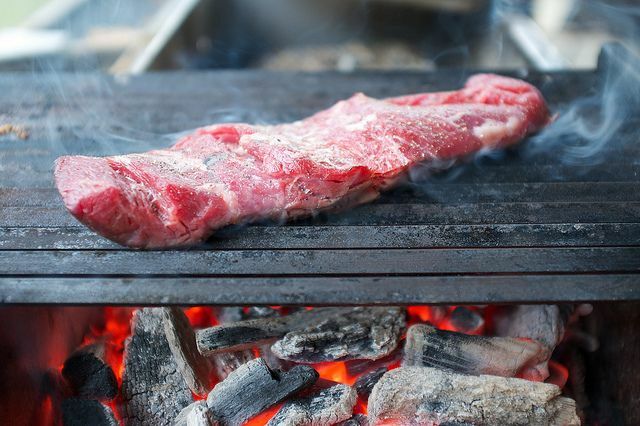 Today: The rules of the grill, from a former line cook. I use a pair of kitchen tongs and quickly flip a steak, pull back to let my hand cool for a split second before diving in again behind the safety of the tongs to flip another. The hair on my forearm recoils from the heat. Even with a long pair of kitchen tongs I can't bear the sting of the glowing coals like I used to. As a line cook I had a stint at the grill station. I did it for years. But I have lost my commercial kitchen hands: the hands that could take the heat without flinching, the hands that could grab thermonuclear plates, or move steaks around on a grill without ever noticing the heat. The heat-abused hands that were once my badge of honor. One of the steaks is cooking too fast, charring too much, so I move it to a cool spot on the grill. All grills have hot and cold spots. The steak next to it needs to cook longer before it gets turned, but instead of waiting I turn it onto the hot spot of the steak I just moved. I remove the steaks from the heat and set them on a tray. They are resting and so do I. I sit down in the rattan chair at the far side of the screen porch. A green Depression glass tumbler sets on the end table. It is perspiring too. I pick up the glass and gulp the cold lemonade. At the beginning of this summer something changed. 1. I have never seen food as mine and yours. I have always felt it to be a shared experience and as such I have gravitated to family-style meals and it holds true for the grill too. I look for steaks or cuts that will be sliced and passed. I am not a fan of the "my steak, your steak" way of eating. 2. 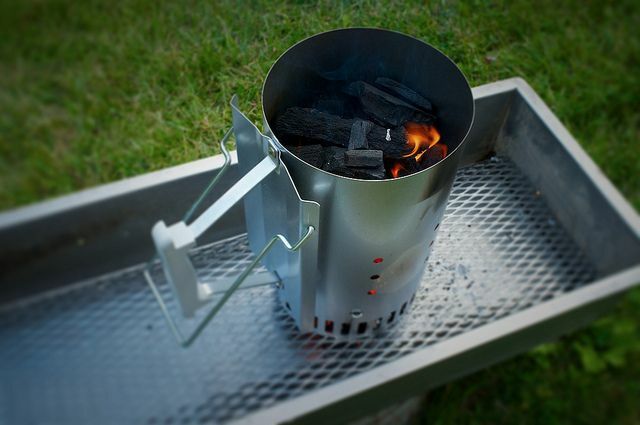 Hardwood charcoal and chimney starter only, no briquettes or lighter fluid. 3. Grilling to me means direct hot heat and smoking is low and slow. 4. Salt meat early and evenly and let it absorb the salt before cooking. 5. Use the force Luke. Unburden yourself of the instant read thermometer. It is nearly impossible to get a good read on most quick-cooking cuts of meat. By paying attention and using the same process each time you use your grill, eventually with the push of a finger you will know when it's the right temperature. Save the thermometer for big hunks of meat and the smoker. 6. Buy the kind of meat that is acceptable to you and don't let anyone bully you into something else. If you only want free-range, grass-fed then pay for it. Personally I like how many farmers do things here in my own backyard so I buy beef from them. The beef I buy tastes like the beef I remember tasting as a child. To me it is how beef is supposed to taste. 7. 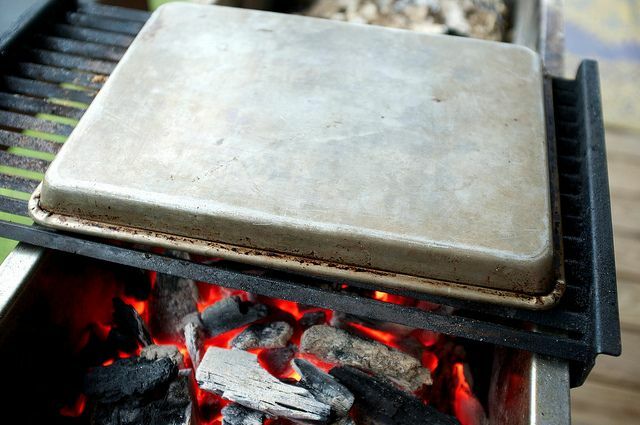 The easiest and simplest way I have ever found to clean the grill is to simply turn a sheet tray over when the coals are hot and let the heat do the work for you. 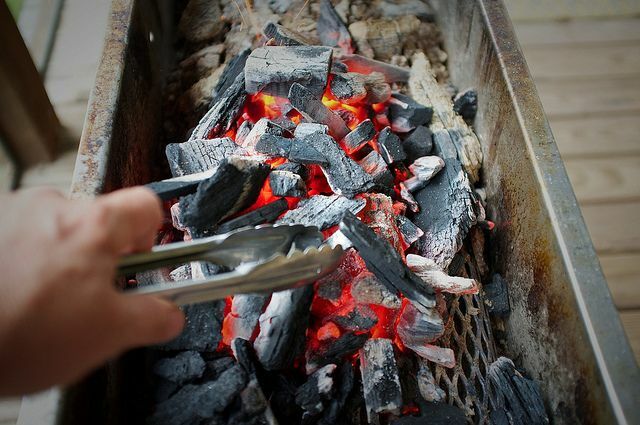 After 10 to 15 minutes, using a sturdy pair of tongs, remove the tray (which is now extremely hot so use extreme caution) and lightly brush the ashes away with a wire bristle brush. The grate is going to be extremely hot so it is best to wait for it to cool down before grilling. If your grate is larger than the tray, then just move the tray around in 10- to 15-minute increments. Where ca n I find the type of grill in the picture. Where do I get a grill like this!? Great article, especially because it upholds my end of the family arguments. I'm going camping tomorrow and plan on grilling some large pieces of meat. Thanks for the great grilling tips and well written article thirschfeld! I'll definitely use the information I learned here. I wonder about salting meat early. How early? I've noticed that the salt pulls the juices out of the meat right away so I always salt just before putting the meat on the grill. Stacey I salt twenty four hours ahead sometime. It is much like brining, which has to do with osmosis, and in the end your steaks will be even juicier. If you salt them just before you put them on the grill the salt just falls off into the grill. I find that 20 minutes is just the right amount of time for salting steaks. It's long enough for the salt to start dissolving into the meat but not so long that it 'bleeds' it. Thanks. I made a porterhouse steak the other day and salted it about 90 minutes before grilling. I also seasoned it with Seneca Salt Java Rub (salt from NYS's Seneca Lake plus seasoning). My husband said "best stead of the summer!" Very cool. Sorry, I meant very HOT, Tom. You are welcome, Tom. I always look forward to your contributions. And you are right, briquettes are for sissies. At least in my opinion, so are gas grills. Nothing like smoke and meat. While I definitely share your sentiment about the gas grills, I can't say the same for the briquettes. Their best attribute is they are all the same so it makes controlling temp a little easier. I stick to just plain old Kingsford charcoal. I've done quite a bit of research on the different hardwood charcoal companies that are sold around in stores and you'd be surprised at what you are using. If you grill as much as I do, ordering nice hardwood charcoal becomes rather expensive. The biggest problem I've found with the hardwood charcoals that are readily available (at least in my area) is the quality. I've found that many of them get their wood as scraps from furniture builders. Also, they are known to have many things other than wood in the bags. I've personally seen what I think was ceramics in more than one bag (the biggest reason I went back to Kingsford.) Plus, I was not happy with the amount of dust and small pieces in the bags. That makes it much more difficult to smoke a pork shoulder for 14 hours if you are using 3 bags and opening the lid every 30 minutes. Sorry about the rant, just wanted to add to the conversation. Anyways, Grill on friends! Oh, I wanted to also say that to get smoke, I use gourmet smoke wood chips from a specialty vendor out of Rochester, NY. They really do it right and have pretty much anything you would want. It's true that when using lump charcoal you do get plenty of dust and tiny scraps at the bottom of the bag. But if you like the taste of petroleum with your food then stick with Kingsford. Briquets are full of fossel fuel and they burn way too hot. Amazon sells amazing mesquite for much cheaper than anywhere local and the product comes in very large pieces. Check it out.